Rainbow Mountain Peru Trekking 2days, Vinicunca, (5040m, 16535,43 feet); from high above, its geological formations reveal all their splendour, in a contrast with the blue sky forming a formidable barrier enters the coastal desert and the Amazonian jungle, imposing Vilcanota mountain range, counts almost as many glaciers as the White range, Located at the south of Cusco and dominated by AUSANGATE Mountain (6384m, 20944,88 feet), this moved back area always remained isolated from the external influences, Qesiuno, Chilca, knews to keep intact much customs and habits of the pre-colonial period, However, Rainbow Mountain Peru trekking 2days are very excited to be able to offer APPs travellers a hiking alternative that is second to none. 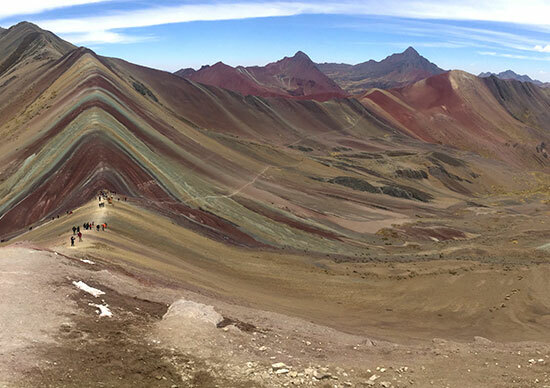 Why Rainbow Mountain Peru Trekking 2days? 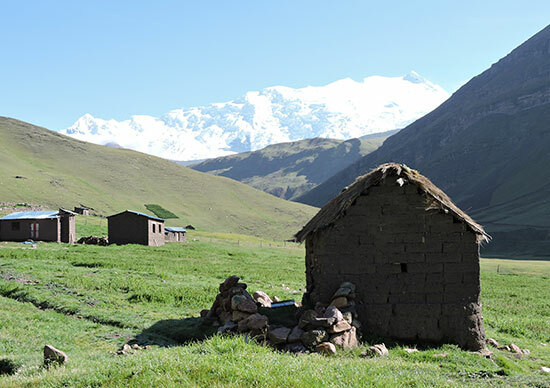 This trek will satisfy most demanding and will get unforgettable memories as sumptuous panoramas of high mountain, formidable glaciers and crystalline rivers, turquoise lakes, peaceful pastoral scenes of the herds of spangled and alpacas kept on by Andeans with multi-coloured clothing This new route, different of the beaten paths, is a true adventure through a nature preserved and wild, where the only meetings which you will make will be Ausangate, Vincunca, Rainbow Mountain Peru Trekking 2days , Pucapunta (the red mountain) and small communities of Quechua-speaking Inca descendants that exploit the vast wide ones of Altiplano. The route achieves a circuit of scale, passing by collars located between 4710 and 5040 meters, then turn over to the small village, starting point of the circuit Qesiuno. VINICUNCA, Rainbow Mountain Peru Trekking 2days, is listed among the newest and on of the best attractions in the world. Definitely, unique hiking adventures that you will find in Peru. Native communities of Quechua-speaking Inca descendants that exploit the vast wide ones of Altiplano, snowcapped mountains, shepherds path, alpacas and maybe the andean condor. DAY2. AUSANGATE /VINICUNCA RAINBOW MOUNTAIN/ CUSCO. DAY 2.- AUSANGATE RAINBOW MOUNTAIN PERU TREK/CUSCO. 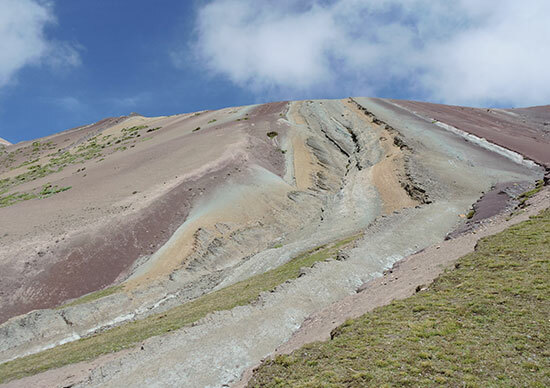 To go on the Ausangate Rainbow mountain Peru 2d trek, you must be in good physical condition, and we recommend a preliminary 3 days acclimatization stage, for your body to react better during the trek, as we will be in hiking up to high passes at altitudes of about 5,100 meters, 16535,43 feet. and it also is important to drink plenty of Muña tea /or coca leaf tea. 5.English/Quechua/Spanish speaking professional guide (you will have an assistant guide for groups over 6 people). 10.Meals: Day1. snack, lunch & Dinner; Day2. Breakfast, snack, Lunch. (optional vegetarian food). Our professional cooks prepare meals that incorporate elements of the western diet and also traditional Peruvian delicacies. (communicate with your guide/cook during the trek if you have a preference for certain types of dishes). Salads, if served, are washed in boiled water. 11.Horses (for equipment and personal items) including horsemen. They carry camping equipment, food and kitchen utensils. We provide duffel bags at your briefing for your personal items and sleeping bag (up to 7 kg/15lbs per person). 16.Private transport to your hotel at the end of the trip. 1.Breakfast on the first morning. 2.Dinner on the last night. 3.Sleeping bags – If you haven’t got a sleeping bag or you don’t want the hassle of bringing one all the way to Peru with you, then we have sleeping bags for hire.